I should just ignore every quack in medicine, but this one allows me to write some criticism about a pseudoscience – psychic readings – that I thought were long ago debunked. Besides, maybe I can bring a chuckle to some of you. One doesn’t really hear the word “medium” much any more, unless you’re watching 1950s horror movies. But it has a real definition. A medium is someone who claims to speak with spirits, non existent entities that have been the subject of myths since humans could communicate with one another. Most mediums are charlatans who trick people out of giving up their money, while using a series of psychological tricks to make it appear that they really do communicate with the nonexistent spirits. Just to be fair, there are a few “mediums” that call themselves mentalists, who are upfront and honest about their use of psychological and mental tricks (using assistants who provide information) to appear to get information about you from mysterious places. I find them fascinating, because it takes a lot of skill to identify cues that help the mentalist dig down into some factoid that appears to come from magic places. On the other hand, there are mediums who really believe they have some special, magical power. A power that simply does not exist, and has never been shown to exist. A medium generally uses one of two methods to convince the subject that information is being passed to them. The first one is called a “cold reading”, where the medium asks questions that appear to be a spirit passing along information. But these are very open ended questions that make it appear that the medium knows something special (again, from those nonexistent spirits). Now most mentalists (who do this for fun, and, profit) use this method. They are always observing cues in the subject that may lead them to narrow down the questions. I have to believe that a good mentalist should probably become one of those millionaire poker players. The other method is called a “hot reading,” where a co-conspirator gets real information about the subject. This method is the lazy way to do it, because it takes no skill, other than, in today’s world, access to Google. Let me be clear. The U.S. National Academy of Sciences gave a report on the subject and concluded there is “no scientific justification from research conducted over a period of 130 years for the existence of parapsychological phenomena.” (See Druckman, D. and Swets, J. A, 1988). James Randi, a former magician and mentalist, eventually became a serious skeptic of spiritualism and the occult. Famously, he had an ongoing challenge that would pay $1 million to anyone who could provide solid evidence that psychics could actually speak to spirits or read minds or do anything without tricks. No one ever got the money. There are literally dozens of stories where hucksters who pass themselves off as mediums that have been thoroughly debunked by real skeptics everywhere. Unless you accept anecdotes as data (they aren’t) or pseudoscience is more powerful than real science, then there isn’t real, unbiased evidence that Anthony William can diagnose any disease. Moreover, since William has no education, license, credentials or anything in real medicine (he even lacks credentials in junk medicine, like naturopathy), he couldn’t diagnose even the obvious chronic or acute medical conditions afflicting any person. A real physician can, through observation and casual conversation, diagnose serious diseases like neurological disorders, many cancers, infections, and many many other serious conditions. A cough may be just be a cough. It could be an allergy. It could be an infection. Or it could be a symptom of a serious form of cancer. Maybe William has one a “gift” of superior observational skills, and can use psychology to figure out a few medical conditions. But because he lacks medical training and education, beyond maybe watching 15 seasons of E.R. on TV, he can’t diagnose more serious diseases just from his observation. Anthony’s unprecedented accuracy and success rate as the Medical Medium have earned him the trust and love of thousands worldwide, among them movie stars, rock stars, billionaires, professional athletes, best-selling authors, and countless other people from all walks of life who couldn’t find a way to heal until he provided them with insights from Spirit. If William isn’t a charlatan, but genuinely believes he has a gift (based on real evidence based observation skills), and if he were a real physician, he probably good do good things. But, are you going to trust your diagnosis to someone who thinks he speaks with nonexistent spirits? Sadly, over 1 million people “Like” his page on Facebook, so we have to assume that a lot of people do trust their diagnosis to someone like the Medical Medium. Unfortunately, his pseudomedicine actually gets worse. Even if we could assume that William cold communicate with spirits (no evidence of this, but let’s imagine), what kind of medical advice will you get? Well, there’s a lot of evidence that he is a total believer in alternative medicine. For example, he’s a supporter of homeopathy, which we all know is nothing but water, and has no clinical usefulness other than quenching thirst. There is absolutely no evidence that homeopathy can treat any disease. In fact, the whole basis of homeopathy is the pseudoscience of water memory, which has been thoroughly implausible according to every single bit of physics, chemistry and physical chemistry known to man. If water memory was real, the discoverer would be renowned throughout the world, and we’d have to throw out all that we know in science. Sure, that could happen, but it would be along the lines of proving evolution untrue. 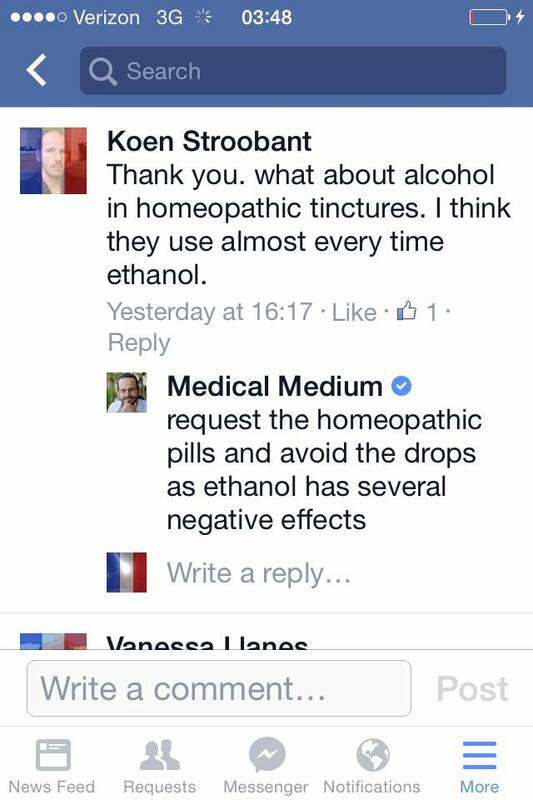 I’m sorry, but it doesn’t matter if homeopathic nonsense is in water or ethanol – it doesn’t work. The Medical Medium claims that artichokes stabilize blood sugar, an important issue for diabetics. Sure choosing the right foods can help maintain a proper blood glucose level. But artichokes will not do that alone. 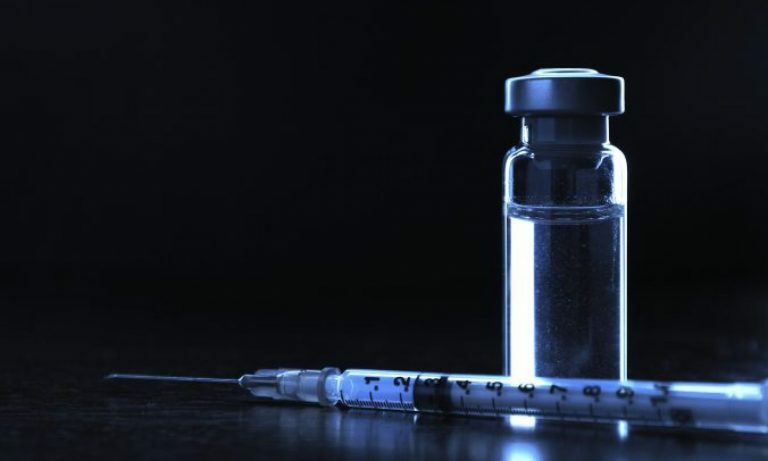 For type 1 diabetics, there’s only one thing that can control blood sugar accurately, and it’s injected insulin. Period. End of story. A type 1 diabetic can eat all the artichokes they want, all day long, and without insulin, they will die. Moreover, since one cannot live on artichokes alone, a real diabetic looks at all of their diet and activity to control blood sugar. Yes, there is an artichoke that may be important to blood glucose control. It’s called a Jerusalem artichoke, which is unrelated to the artichoke we eat, and it may be useful because of a particular type of glycoprotein in the tuber, which can add fiber to other foods. 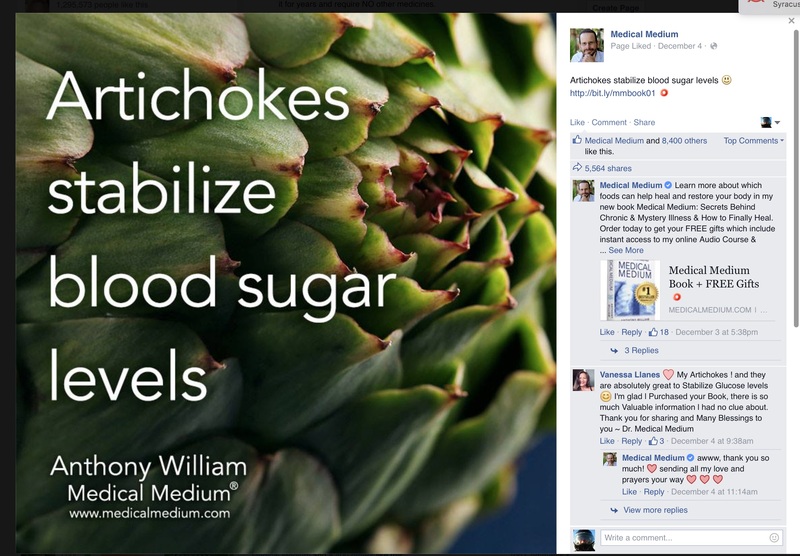 So, once the Medical Medium diagnoses diabetes with his magical abilities, he’s going to recommend eating artichokes as a treatment? There’s simply no evidence, except for small studies published in really bad journals, that artichokes can reduce blood sugar. So, cucumbers are the next super food. William, using his magical abilities to speak to nonexistent spirits, has diagnosed you with a long list of diseases, and recommends a freaking cucumber? First of all, a cucumber is 95% water. So, there’s not a lot there. Cucumbers are not “rich in nutrients,” except for Vitamin K, which is important to blood clotting. And there is NO erepsin, a term that has been deprecated for decades because it is inaccurate, in cucumbers. Erepsin, a group of intestinal enzymes, are produced by the intestinal tract and is not from a cucumber. And it’s not going to destroy parasites, since most have evolved resistance to these enzymes over millions of years. But let’s go on. Is it a diuretic? It contains no compounds that are diuretic, except for that 95% water. 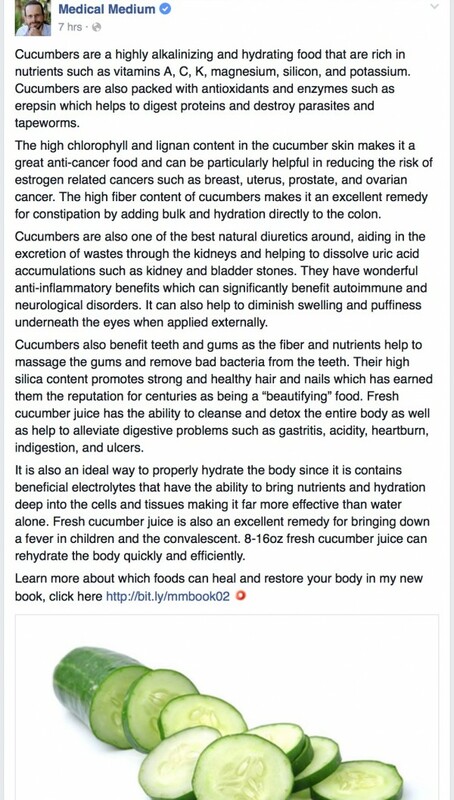 I guess if you ate a dozen cucumbers, your osmoregulation would expel some of that excess water. It’s not high fiber, containing maybe 1g of fiber per one cucumber. Seriously, a slice of wheat bread has 5X that amount. There is no evidence that cucumbers can treat the list of medical conditions that the Medical Medium claims. If I give him the benefit of the doubt that he can actually talk to these nonexistent spirits about a particular medical condition, William’s “treatment plan” won’t do anything he claims. Worse yet, he makes claims about depression, chronic fatigue syndrome, thyroid diseases, and many other complex medical conditions that require serious treatment plans. Let’s look at depression. It is extraordinarily complex, and can be a part of a broader diagnosis, like bipolar disorder, borderline personality, and psychotic disorders. Untreated depression can lead to a psychotic break, which could lead to suicide or violent behavior. It isn’t a mystery, as William claims, it is well-understood. Treatment is complicated, requiring a team of mental health professionals, like cognitive behavioral therapists, psychiatrists, psychologists, and counselors. And yes, real medication. How on earth can you rely on someone who speaks to spirits to treat a real mental health issue? I am frightened that someone thinks they have anything to say about depression who hasn’t thoroughly studied it. Once again, William is NOT a psychotherapist. Anthony William, the Medical Medium, completely lacks any credentials in any area of medicine, including junk medicine like naturopathy or chiropractic. The FDA has not reviewed or been provided with any data whatsoever that William has the ability to diagnose disease nor the skills to treat those diseases. Typical of these types of disclaimers, William states that his diagnoses and treatments should not be substituted for real evidence based medicine. His medical information is not vetted by anyone with a biomedical background. Not only do I think that the Medical Medium shouldn’t be practicing medicine, he also states it publicly and in big bold font. The Medical Medium uses the pseudoscience of spiritual readings plus the pseudoscience of alternative medicine to diagnose and treat patients. Be aware. Be very aware. Editor’s note – this article was first published in December, 2015. It has been updated to fix broken links, to improve formatting and style, and to add new information.